Max Whitlock became the first man to win a gold for Great Britain in the World Championships when he claimed the pommel horse in Glasgow. The 22-year-old scored 16.133 points, finishing 0.1 points ahead of team-mate Louis Smith who claimed silver. "I had dreamed of this moment but never felt I would get emotional," said Whitlock. "Louis did an amazing job to get a massive 16 so to beat that I am over the moon." It takes the Basildon gymnast's medal haul at these championships to three. He won team silver on Wednesday and recovered from the disappointment of missing out on a medal in the men's all-around final on Friday by winning another silver on the floor exercise. 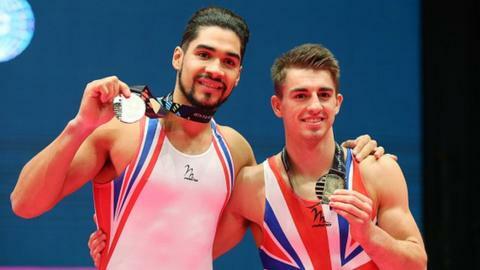 It was Britain's first silver in the men's floor exercise since Neil Thomas in 1994, finishing 0.667 points behind Japan's gold medal winner Kenzo Shirai. He added: "It has taken a lot out of me, my legs are like jelly on the floor but the support from the crowd has got me through. It has been a tough year having had glandular fever but this makes up for everything." Smith, 26, who had previously taken world silver and two bronze on pommel horse, was favourite having qualified top of the apparatus. He had gone fifth out of the eighth finalists and appeared set for gold himself until his score of 16.033 was beaten by Whitlock, the last man to take to the horse. Smith said: "There are seven-and-a-half billion people on this planet and we are one and two on the pommel horse. "I am happy with the job I have done this week and we have qualified as a team for Rio." Whitlock is only the second Briton to win a World Championships gold after Beth Tweddle, who achieved it three times. Tweddle told BBC Sport: "I don't think Max realises how much of an impression he is having on these competitions. He saw Louis get that huge score and knew he had to beat him. He kept his head down and did his routine and looked so relieved afterwards." In the women's uneven bars, the gold medal was shared by China's Fan Yilin, Madison Kocian from the United States and Russian team-mates Viktoria Komova and Daria Spiridonova, who all scored 15.366. With the giant television screen confirming that there were indeed four champions from the eight-woman final, the gold medallists stood with their arms around each other in a straight line as the crowd gave them a standing ovation. While so many gold medals have never been given out in one event before, there was a five-way tie for silver at the 1922 championships on the pommel horse.